Now of course the speakers were chosen for their adulation of Beethoven, but one fun fact i that two of his pieces were put on the gold record aboard Voyager…to spin his music for any ‘listeners’ out in the universe. 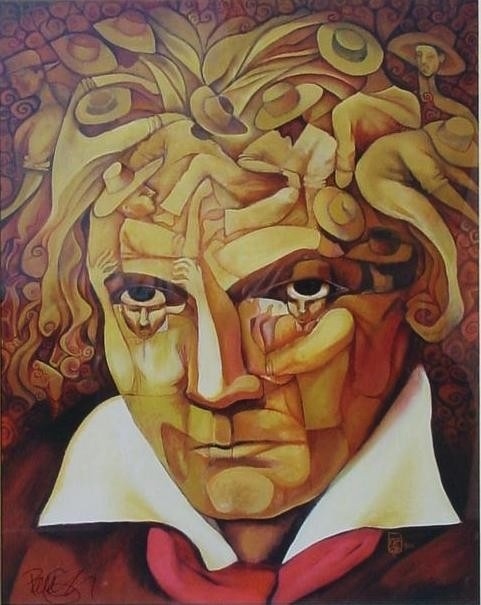 If there is one part of the film on youtube that shows Beethoven as a humanitarian in search of the elevation of the condition for all, as well as showing his furor at feeling ultimately deceived, but eventually adapting to it by rebranding his symphony. I liked: “If someone mentioned Napoleon, Beethoven would say, ‘Well, he may be the ruler of the world…but mine is the Empire of the mind’.” He was known for melding the life of the mind, and the life of the heart. That causes me to remember that when he was born in Bonn circa 1770, he was baptized Ludwig Van Beethoven, as was his Belgian father’s surname. Being a skilled musician after early tutoring by his father, he was brought to the attention of Mozart and Haydn, both of whom he studied with over the first two decades of his life. When he caught the attention and patronage of the aristocracy, he was rebranded Ludwig Von Beethoven. This is Helene Grimaud, quite the piano virtuoso and tender humanitarian herself, playing his Piano Concerto No.5 ‘Emperor’ as she adds color to his life story. But oh, woeful Beethoven! It was seemingly written in his stars that he only fell in love with his femalearistocrats, especially his piano students, and was never allowed to marry them, not being an aristocrat. There was no such thing as upward mobility: bloodlines ruled. He wrote many wonderful sonatas for his loves, and penned them heartfelt letters chronicling the misery caused by their rejections of him, although ‘Für Elise’ Bagatelle No. 25 in A minor was only published forty years after his death. “Für Elise” Bagatelle No. 25 in A minor was only published forty years after his death. Ah, well, now: Heiligenstadt. Around 1796, at the age of 26, Ludwig’s hearing began to further deteriorate. He began to withdraw from society increasingly, unable to respond to the witticisms and chatter of social gatherings. For him, his deafness and poor health also indicated that he might never find the wife he so avidly sought, thus never father the children he also craved. In 1802 he moved to Heiligenstadt outside the walls of Vienna, as his doctor had recommended, partly for the baths, and partly to come to terms with his deafness. He wrote to his friends of his desire for death, but discovered in the end that his passionate love for his art…precluded taking his own life. Revived, refreshed, and with a renewed purpose, he kept defiantly reinventing the limits of music; he could still imagine the notes (words) for what he wanted to say. As his deafness grew, some called his pieces ‘crazy’. During this period, he turned to compositions for string quartet, again, having to remember sounds, notes, and phrasings. They are applauded by musicologists as some of the best pieces ever written. Just after his last public performance as a pianist, he composed the symphony most familiar to the world: ‘knock at the door, knock at the door’ (da da da dum)…his 5th Symphony. It broke a lot of musical conventions, as so many of his compositions did. One piece held a rest for…four full whole notes…before it began again. Un.heard.of. The man experimented with building tension by use of asymmetrical pace and patterns, mirroring his own tumultuous life perhaps. Some musicologists credit the allegro breaking wide open in the first movement as one of the best moment in music ever. The version from the film isn’t available, but this is a cello/violin ‘spirit’, and the painting is lovely. Or else I have the wrong portion, which is entirely possible. By the time he died in March of 1827, he’d written 138 works with an opus number, and 200 more which were never assigned one; even one single opera, Fidelio. As his deafness worsened he performed less and less, and his last public appearance was in 1814, thirteen years before his death. …a flashmob plays Beethoven’s ‘Ode to Joy’ in Sabdell, Spain in 2012, which song is (by the by) the anthem of the EU. ;-) I can’t thank each and every one of them enough. Oh, do watch the children in the audience; they make your eyes brim over in tears. Their lives may have been changed in glorious ways forevermore. Don’t you want to just hug the stuffin’ out of ’em? This entry was posted in music and other videos. Bookmark the permalink. EU! More like, eau de Joie; if their future in Chicag0’s TTIP, Grater Eurasian Co-Austerity $phere is realized! Lovely interlude, wendye – and I most appreciate it as I retreat from the heat of the day! I went searching for my own links to Beethoven, beginning with ‘studying’ (if one can claim to do such as a Freshman college student) the 9th Symphony – back in that day my hero was Sviatislav Richter on the piano works but my computer doesn’t do him justice, so I won’t try to post a link. that he wrote two masses may have caused her to assume he was catholic, but it seems not to have been so, no matter. beyond poetry” for one, and “beyond music” for the other, oh yes, creative genius is often spiked by suffering. also, i’d answered your pelosi question of (iirc) the open menu…somewhere, and i do have an update, fwiw. I’ll disagree with Eliot in one respect – this is my favorite of the quartets, though I certainly can’t claim to be an expert. Sorry about the ads but I hope you’ll find the music worth it. I have an essay by Donald Francis Tovey, “Some Aspects of Beethoven’s Art Forms”, which I need to study more with reference to his observation that “. . .the facts of key relationship can be quite clearly illustrated to young and inexperienced music lovers [I’m the inexperienced, sadly] but the illustrations must consist of the music itself. . . ” Tovey takes the listener through each of the movements in this quartet to illustrate the ‘argument’ of the piece much as we saw an argument in the symphonies as well, so yes, the aspect of music as a universal language is a joyous aspect indeed! i like it a lot, too, juliania, and yes, i think it would be quite accessible to young uns as well as the erudite ‘experts’. ;-) tovey aside, the young would likely hear their own versions of the discussions and arguments, and might just hit on what beethoven had meant to say. i do hope you watched the flashmob video from spain performing ‘ode to joy’, speaking of ‘the chirren’. they all seemed to hear it, love it, and seemed to be jumpin’ out of their skins in ‘joy’. damn, cellos and violas are fine instruments, aren’t they? our friend ryan brown used to play chamber music, and now conducts opera lafayette. he brings us their current recordings when he comes (from deecee), but i’d love to see him conduct a performance, but recording them is a major no-no, apparently. i guess the same is true for our amigo chris trakas, so only rehearsals are available on youtube. i hadn’t included this in the OP, since it was just a personal anecdote of no particular note. our long-ago friend and political ally, russell martin, a writer stuck for a new idea for a book…was advised by his editor that a lock of beethoven’s hair had (then) recently been auctioned off at southeby’s. he indeed wrote the book of the same name (although i never read it, so hadn’t known that ‘two American Beethoven enthusiasts, Ira Brilliant and Che Guevara, purchased it in 1994’. but in honor of russell’s book and achievement, i put one of beethoven collection CDs on. irony alert: he never even noticed, and i would swear that he never played or became familiar with his incredible musical ouevre. while that seems far-fetched, i do remember one man telling a story of a time he was begged to play for the guests at some salon or other. he sat at the piano, opened the keyboard lid, slammed his forearms (elbows out, with fingers touching) on the keyboard: Bam!, got up and walked away. another story said once he was deaf, he’d have to turn to look at the audience to see their reaction, as he couldn’t hear the applause. My all-time favorite performance of one of my all-time favorites by West–Eastern Divan Orchestra Daniel Barenboim, conductor @ BBC Proms 2012. These folks did the cycle that year and they freakin rawked the 2nd. oh, thank you, leMoyne; it was magnificent, and boy, was it just what the doctor would have ordered this morning. i hope you watched, or will, the flashmob in spain playing ‘ode to joy’. somehow, when the woman walked in with her bassoon…well, all of it just knocked me out. When you said he wasn’t Catholic, wendye, you sent me on a hunt all over the place – fascinating stuff, thank you! I go with the group who say he was, just as Rachmaninoff, who didn’t attend church very much either, was Russian Orthodox. Beethoven was the best kind of Catholic, using his music to take that faith on the journey it needed to take. I went to a few sites that had inklings of what I would call the right ‘take’, and finally one whose thesis was the Missa Solemnis itself, explained as extensively as my Tovey article does with the C Minor Quartet. It was a long, long article and you will be very happy I don’t link to it. As I remember, Beethoven worked on the Mass for four years. Parts of it are almost impossible to sing or to play – I remember there was a sustained soprano high note at one point, confusing directions for bass support at another, various problems with pedantic renditions when this was an orchestral elaboration upon Christian faith and not really to be part of church happenings per se. Rachmaninoff didn’t have such problems in his liturgical pieces, since no instruments are used in Orthodox churches, but rarely would a choir be able to perform his difficult works in a church setting, based though they are on liturgical chants. Some of the big Russian Cathedrals, maybe. We did a concert once at Saint Francis Cathedral (Catholic!) using two of his liturgical pieces. Gorgeous music. The Cathedral was packed; people loved it; and again, it soared. your take may indeed be the right one, juliaina. i was just going with director phil grabsky’s take since he’d said he’d traveled all over europe doing interviews with musical historians and researching beethoven’s letters, etc. the main reason i’d even mentioned it was that i’d considered it rather charming of him as a non-practicing catholic to work so long and hard on his ‘missa’ while composing the Ninth as well. that’s all. Yes, I did understand your mention, wendye, which caused me to wonder, so I went surfing and it is always fun to read the pros and contras. Even some Catholic music critics are of the good director’s opinion, so it is an interesting controversy. I had even in my muddled mind thought ‘Lutheran’ and to find the little Catholic enclave to which his parents belonged was interesting. Anyway, that he was but many thought he wasn’t is rather heartwarming as the same thing happened to Christ. Last night I read Pope Francis’ latest encyclical on caring for the earth, very lengthy but some beautiful passages. Unfortunately he went very light on genetic modifications, really misunderstanding what the problems are with that I think. His reflections on Genesis and other Biblical passages were lovely, though. happy to hear you enjoyed your romp through the controversy, ww. yes, i saw headlines about francis’s encyclical; good on him. An early sonata with the great Sviatoslav Richter! dunno if you’ll see this, jacob, but it would be cool if you posted some of your art and photos slideshows. this tells the workaround that works best for me. Thanks, Wendy! I’m almost ready to post a large group of paintings, so far unseen by any human being and I can’t imagine a better pair of eyeballs to try them out on!